Note: These healthy carrot cake cookies (originally titled “Hippie Cookies) first appeared on January 27, 2012. The recipe has been edited slightly and now includes a delicious cream cheese almond butter icing and the pictures have been updated and video included (scroll down to right above recipe card). These cookies have been a long time go-to healthy dessert recipe as carrot cake will always be one of my all-time favorite desserts. I’m still amazed at how true to taste they are to the cake without any added sugar and a simple, wholesome ingredient list. 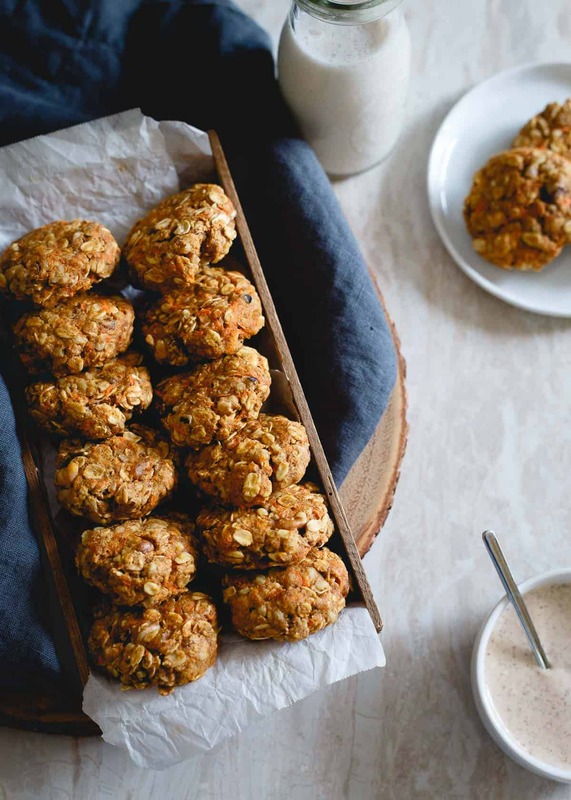 These healthy carrot cake cookies made with oats and whole wheat flour are packed with raisins, walnuts, lemon zest and ginger. Drizzle them with the optional almond butter cream cheese topping for a true creamy carrot cake like bite. No added sugar, no butter, still completely delicious and guilt-free. Every time I make these cookies, I second guess myself while grating an entire cup worth of carrots to go in them. When there’s that much of a vegetable in a cookie, can it still be considered a cookie? Especially when you’re not adding any eggs or any added sugar either. I say yes, and this paleo chocolate zucchini bread agrees. Somehow, this wholesome combination of oats, whole wheat flour, ginger, lemon zest, raisins, carrots and walnuts adds up to one hell of a good imitation of carrot cake. When I’m not in the mood for chocolate (yes, it happens sometimes), carrot cake or any dessert like it, is my jam. Partly due to the spices, partly the texture and mostly (let’s be honest), the cream cheese icing, carrot cake (as long as it’s not dried out – the worst!) is always a winner. These cookies, right down to the cream cheese almond butter icing, give you all those things in a healthier cookie bite. Totally delicious, wholesome enough you could easily justify them for breakfast and the kind of recipe that has zero guilt attached to popping 3 or 4 of them in your mouth on your way out the door to your workout (I know nothing about that). 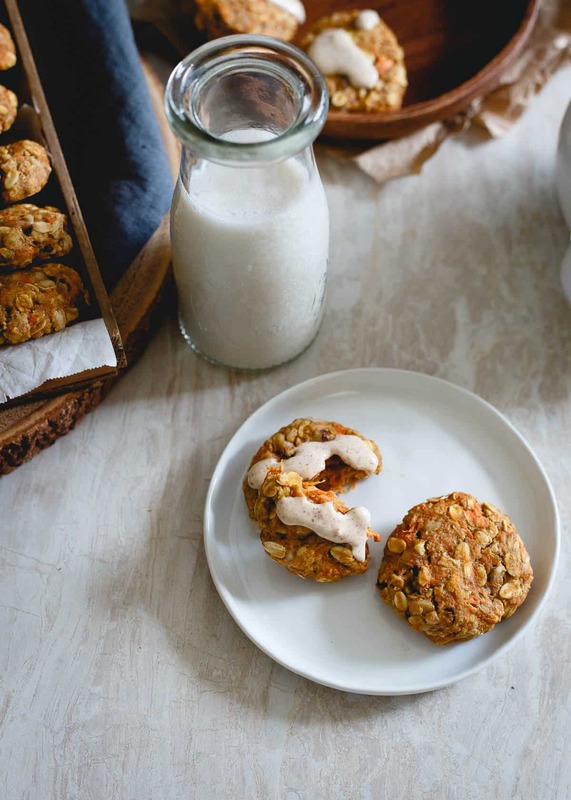 If you love carrot cake cookies but want a paleo version, check out these paleo carrot cake cookies – super similar but totally grain and dairy free! Oh, and that icing? 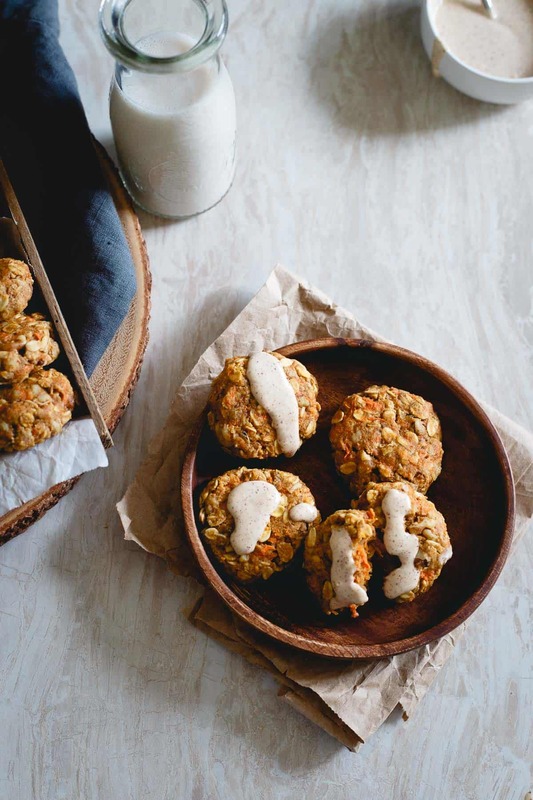 Drizzle it on all the things, not just these healthy carrot cake cookies. Like oatmeal, yogurt, berries, ice cream… It’s magical. These healthy carrot cake cookies have raisins, lemon zest, ginger and walnuts in them. No sugar, no butter, still completely delicious and guilt-free. Preheat oven to 375 degrees, line a baking sheet with parchment paper or silpat. In a small bowl combine coconut oil, apple butter and maple syrup. Whisk together until smooth. Add wet ingredients to the large bowl and mix until thoroughly combined with a spatula. Roll dough into golf ball sized balls, place on baking sheet and gently press down to form disc shape. Cookies won't flatten or spread much with baking. Bake for 10 minutes. Let cool on baking sheet for a few minutes before transferring to a cooling rack to cool completely. 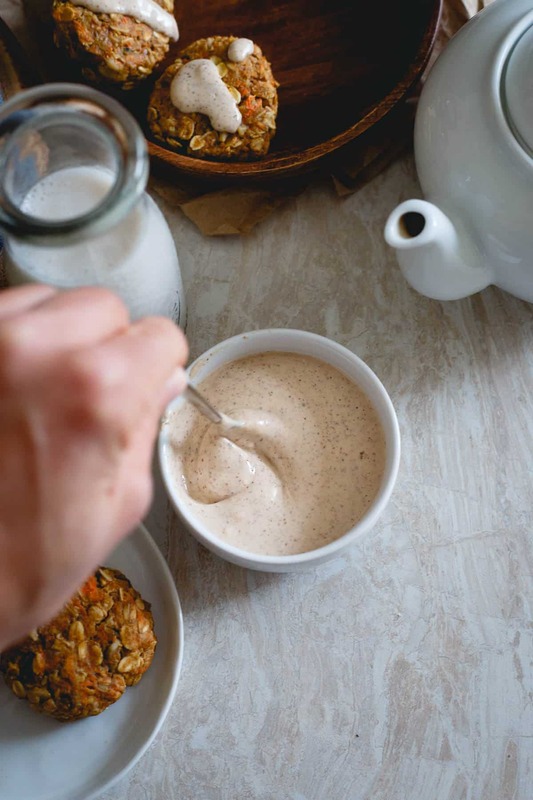 Stir the cream cheese, almond butter and stevia together in a small bowl. Slowly add almond milk until mixture is thinned out enough to drizzle on cookies. Drizzle cooled cookies with icing before serving. Omit icing for vegan version, use paleo cream cheese icing from these paleo carrot cake cookies or, use a vegan cream cheese substitute. wow, these are definitely guilt free looking! i would love to have some of these next to my desk so i can just snack on them without feeling like crap. all the ingredients combined in this make it seem like great flavorings and a well-rounded snack! These definitely look “wait worthy:)” the names takes me back to high school. I went to a liberal Quaker school and there were lots of Birkenstock wearing and hackey sack playing hippies. These look so amazing. You know I love carrot cake right? Ha. I <3 the name. Mmmm love the sound of these! I can appreciate a good hippie cookie coming from vermont hah. You know, that’s one “hippie” thing I’ve never tried! You just made my day! I (happily) have everything on hand to make these so my wait is about to come to an end :-) Have a great weekend! Oooh I’m loving the sights/sounds of these. Well done, (again!). Write a cookbook already, would ya? Carrots in cookies- woman are you mad?! Oooh, I was excited for this recipe!! I used to work at a vegetarian restaurant, and all of my friends called it “that hippie restaurant.” Whatever– hippie food can be delicious! These look amazing! Love the name too ; ) Happy weekend love! Carrot cake and oatmeal cookies together? Yes please. I made carrot cake & raisin balls about a year ago but mine were no bake. 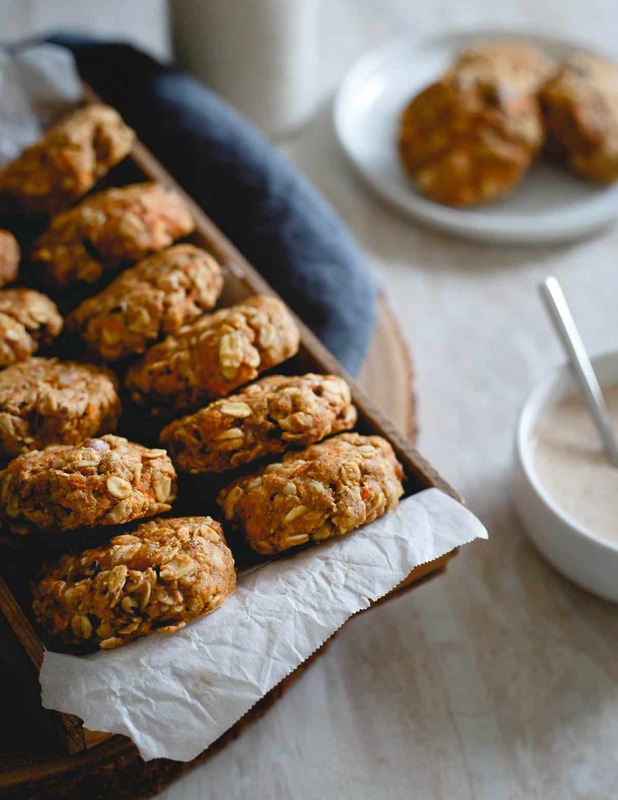 I love the flavors of carrot cake, raisins, oats…these look so good! A very unusual recipe and such great photography! My hippie days are long gone but I must try these. Thank you. I love the unique and flavorful combination of this recipe. Never tried anything like this before. I am sure it will taste really awesome. i’ll have three of these, without the guilt on the side. mmmm sounds delish! Oh yum! Healthy and they look amazing! I need to make some for my snacking next week!!! Thanks for the great recipe!! I made these and they are terrific! The only issue I had was the batter was WAY to soft to roll into balls. I baked them in an 8×8 instead. I’d prefer to make in to cookies. Any ideas why mine came out so liquidy? I measured carefully! I honestly have no idea. My batter was not liquidy at all and looking at the ingredients I’m not even sure how that’s possible! There’s barely any real “liquid” in them besides the maple syrup. I know you said you measured carefully but that would be only guess. I’m sorry! Glad they came out well baked in an 8×8 at least! Thanks for your response. When you measure coconut oil do you melt first & measure or measure & melt? I measured it in a dry (like you would use for sugar/flour) & then melted. Still happy with the outcome of the bars! The measurement should be of the melted coconut oil so I used a measured 1/4 cup of it melted. I’ll edit the recipe to say that. Thanks for pointing that out. Did a dry measure of 1/4 cup turn out to be a lot more when melted? Not positive if it was a lot more because I didn’t remeasure. I will try measuring it melted next time. Thanks again for a great recipe! Just made those and they are yummy! My dough was pretty sticky but it rolled just fine. I stuffed coconut oil into a quarter cup dry measure and melted it, but mine came out less than the liquid quarter cup, so I had to melt more and use the leftovers to grease the pan as I was out of parchment paper. I also used orange zest instead of lemon since I was too lazy to go pick a lemon from my tree and I had some of the oranges from my other tree right there in the kitchen. I was surprised at how feeling those cookies turned out to be. I had one (pretty much out of the oven) as a snack before my walk, and it held me over till lunch two hours later. And my carrot cake hating husband gobbled couple of them up like nobody’s business. Off to make your edamame dip now. So glad you liked them! They are pretty filling and dense. Definitely a nice thing for a cookie! Just made a version of these for Easter Brunch! Turned out pretty well! Let’s hope I can sneak the nutritional info past my sugar loving friends! ;) Thanx for the recipe!! Hope everybody liked them! I was shocked when the biggest hit of our brunch was the huge bowl of zucchini and asparagus I brought. Who would’ve thought people would go for the healthy stuff!? My boys and I would make these disappear in seconds! LOVE how hearty these cookies are! I can’t wait to eat this healthy deliciousness for breakfast! I can’t wait to make these for my son Sean! He’s going to love them! Carrot cake is his all-time favorite dessert! These sound so good! Love a carrot cake cookie. Healthy, but still so good! Sorry, I don’t provide nutritional information for recipes, you can easily plug this into one of the online calculators to get that info if you need it though!